eBook: Traditional Textile Craft- an Intangible Cultural Heritage? 2018 May: Best new sheep and wool book in town. Visit lovely Trun during the summer break! This text covers the wide range of felt production from historical nomadic finds to contemporary industrial applications, as well as, the expressive use of felt in contemporary textiles. Work from Joi Rae Textiles is included and excerpts from email communications between Jorie and the author. 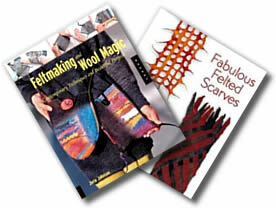 A nice mix of textile artists including felt, leather, knit, stitch and dyeing techniques. Stop by for a Christmas treat for yourself or a friend. Visit Toyoda Gallery in Fushimi. On display are hats ranging from a twelfth-century Egyptian fez to a 1950s Balenciaga hat and couture creations by Jones and his contemporaries. To show the universal appeal of wearing hats, There also are hats worn by celebrities such as Madonna, Brad Pitt and Keira Knightley.